TM 1-1520-240-10 6-6-7 Figure 6-6-2. 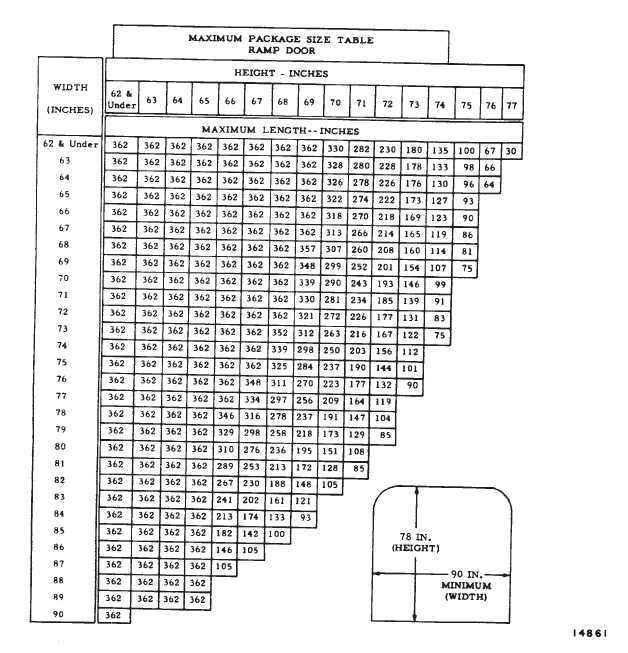 Maximum Package Size (Sheet 3 of 3) 6-6-19. Cargo Loading Ramp. The ramp provides a means of quickly loading and un- loading troops and cargo. It can also be used to support portions of a cargo load which exceeds the longitudinal dimensions of the cargo floor. When used for additional cargo space, the ramp must be positioned so that the ramp floor is level with the cargo floor. In this situation, the weight of the cargo item resting on the ramp must not exceed 3,000 pounds or 300 psf. 6-6-20. Auxiliary Loading Ramps. Three auxiliary loading ramps are hinged to the aft end of the ramp (fig. 6-6-7). When the ramp is lowered, these auxiliary ramps are unfolded to provide flush contact be- tween the ramp and the ground. The auxiliary loading ramps can be positioned to accommodate various vehi- cle tread widths or butted together to facilitate winching of bulk cargo. When not in use, the auxiliary ramps are stowed in an inverted position on the floor of the ramp or removed. One of the auxiliary loading ramps when at- tached to the ramp can also be used as a work platform. A collapsible support attached to the ramp bottom allows the ramp to be positioned at any convenient height when used as a work platform.